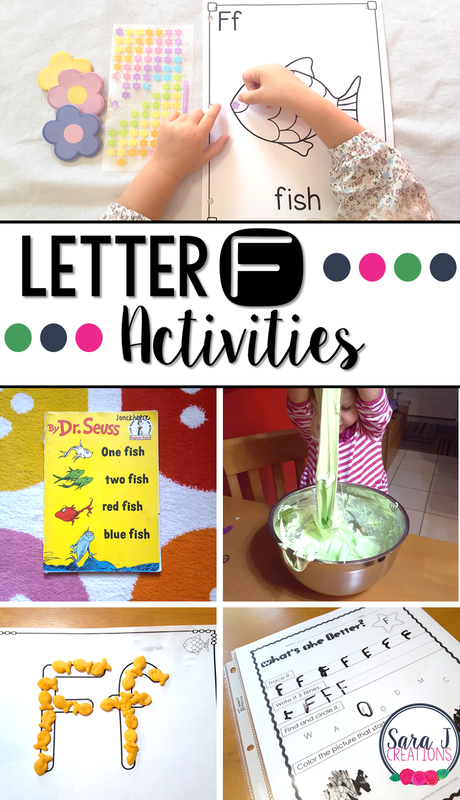 Preview: Letter F Activities that would be perfect for preschool or kindergarten. Sensory, art, fine motor, literacy and alphabet practice all rolled into Letter F fun. Up next in our weekly alphabet study is the letter F activities. We had some handwriting practice, fine motor practice that doubled as a snack and some fun sensory play that was also perfect for Halloween. To start our study of the letter F and a week of fun activities, we read the book One Fish, Two Fish, Red Fish, Blue Fish by Dr. Seuss. We talked about how the word fish starts with F. Then I showed my daughter what an F looked like in the book and we searched for other F's. I made sure to pick a book that matched the picture that we would create next for our alphabet art book. For the alphabet book we are working on, we added F is for fish. We decided to create a fish using flower stickers. It was a little fine motor practice to get those stickers off the page. Then she spread them out on the fish and then colored the tail in with crayon. The alphabet book is part of my Alphabet Centers with Real Pictures. To practice writing the letter F, I put our alphabet tracing sheets in a reusable plastic sleeve and gave her a dry erase marker. She LOVES this part each week and asks to do it multiple times a week. We usually leave it sitting on the kitchen table with the marker and she will sit down and work on it randomly throughout the week. This week, we also used our upper and lowercase practice from our Alphabet Practice pages. I put the uppercase on one side of the page protector and the lowercase on the other side. These are a little more challenging for her but she did a good job tracing and finding the letter and I helped her with writing it. For some fine motor practice, we used some fish crackers to make the letter F. The ABC sheets are part of our Alphabet Centers with Real Pictures. She picked each fish out of the box (practicing her pinch and grab skills) and lined them up on the letter F outlines. For another F themed activity, we used foam shapes and letters. These were pumpkins that I've had for years. She practiced peeling off the paper on the background and sticking it onto the paper. She looked for letters that we've already learned. For a little sensory fun, we made fluffy slime. I used this Witch's Brew Fluffy Slime recipe from Little Bins for Little Hands. We made a green batch and a purple batch and added spiders and bats since it was right around Halloween. My girls love playing with slime but this was our first time with fluffy slime. My only suggestion is to make sure you like the smell of your shaving cream. We continue to finish up a couple cheap bottles that I bought and the smell is just gross as the girls play.